This is a set of eight A3 posters which are ideal a home study aids for all children learning about the Romans. Teachers will also find them an essential classroom resource for introducing the evidence left behind by the Roman occupation of Britain. 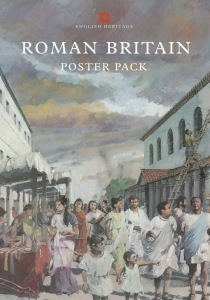 There are four sets of illustrations, each with clear explanatory text covering the army, home life, buildings and crafts and industries, along with four colour posters of artists' representations, bringing famous Roman sites to life. Teachers may photocopy these posters for use in the classroom.